Size 3 - £28.99 Only 2 left! Size 4 - £24.99 Only 2 left! Size 5 - £24.99 Size 6 - £28.99 Only 8 left! Size 7 - £24.99 Only 8 left! If your main ambition is to have the hottest moves on the dance floor, anyone knows that the right dress, the perfect headband, the clutch and earrings, the flawless makeup, and even the right moves are only half of the look. Every outfit needs that one remaining thing to keep the entire outfit grounded so when you stomp down your victory pose, you know that you will make sure that you put the right foot forward. You’ve gotta give your very best first impression to everyone so that you can be sure they will be floored. Actually finding that last piece can be a bit of a stumble, though, especially if you can’t quite put your … toe on it.Of course! It’s the shoes. 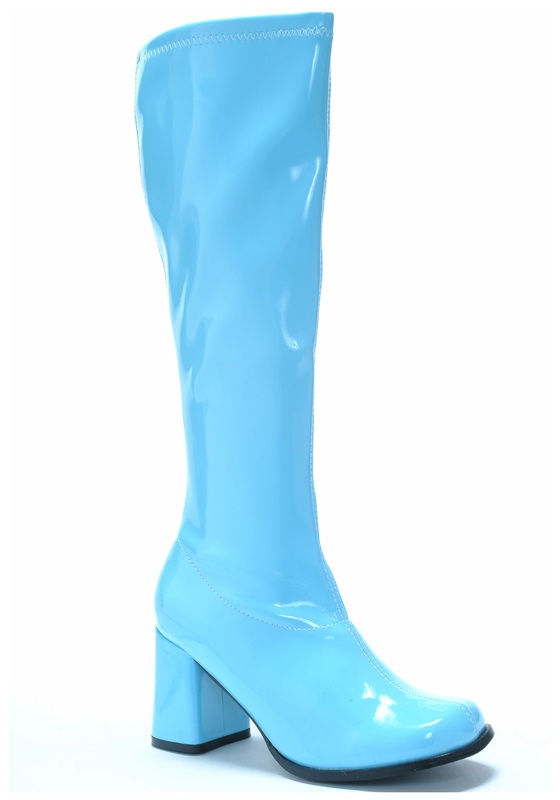 Especially when you are set up to hit the dance floor in your ‘60s gear or looking to stomp down some baddies in your secret agent uniform, it is crucial that you get your feet into these Blue Gogo Boots. With a shining sky blue fabric and a side zipper, the boots are a perfect completion to nearly every eye-catching impression you seek to make. With it’s thick 3” heel, you’ll not only be standing above the competition, but you can ensure that you’ll be doing so with a firm footing.